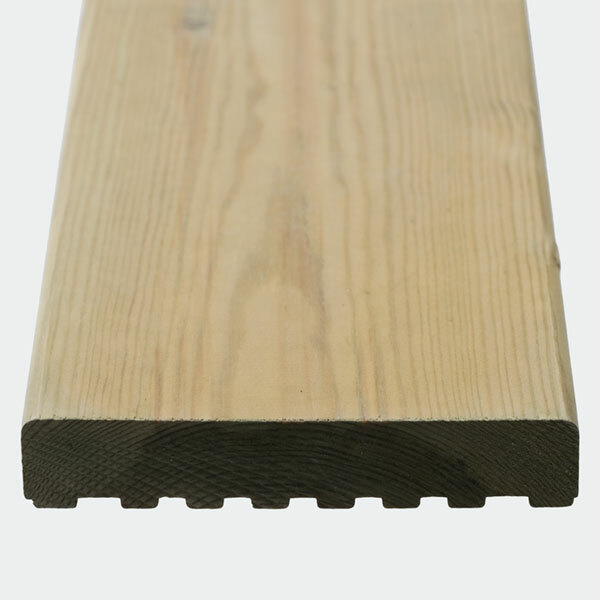 This decking board can be used grooved or smooth side uppermost. Being one of the 2 wider profiles means using fewer deck screws per area. It is versatile by design as it can also accept 2 Q-Grip slip resistant strips. It is preservative pre-treated with Tanalith E Extra giving the timber water repellant properties. Q-Deck Canterbury style decking is made from high quality certified softwood. Its finished size after machining is 27 x 144mm and is a reversible profile. The two grooves either side of the central one can accept Q-Grip strips, which enables deck builders to incorporate slip resistant areas to their deck, where it is needed. Being one of the 2 wider profiles means using fewer deck screws per area. Using the smooth face up gives a more classic contemporary look and actually proves easier to maintain. It is preservative pre-treated with Tanalith E Extra giving the timber water repellant properties.